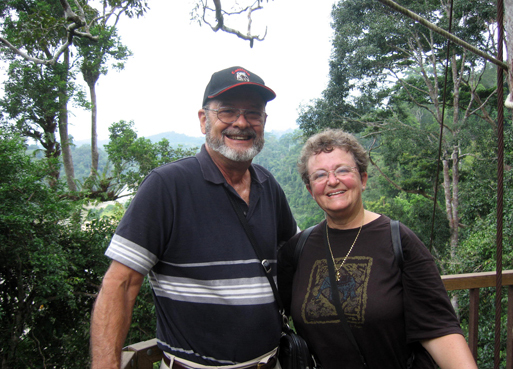 Having first arrived in Malaysia some 21 months ago we figured it was time to explore beyond its beautiful coast. 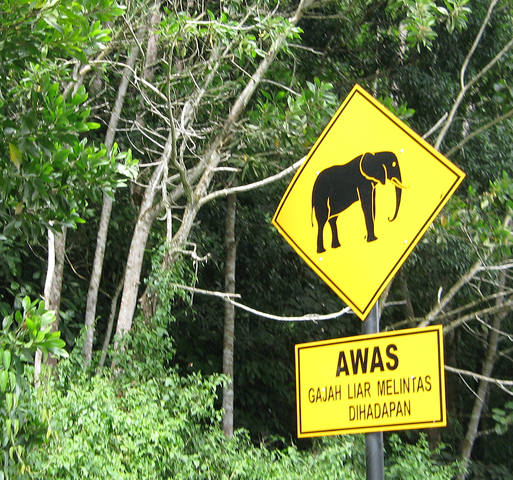 Near the end of July we launched off on a 800 mile driving expedition that would take us through the northern part of the Malay Peninsula. 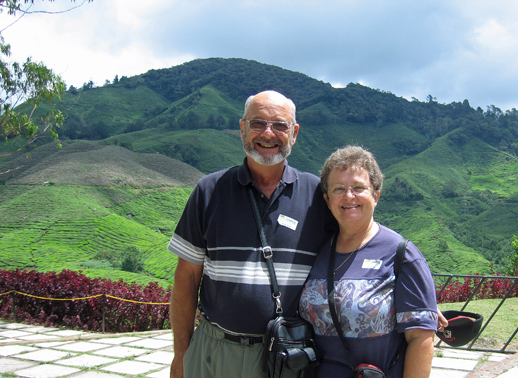 We would visit: the Cameron Highlands along the peninsula's central mountain range; then down through the central valleys to Taman Negara, the country's greatest national park and over to the east coast to the cities of Terengganu and Kota Bharu. 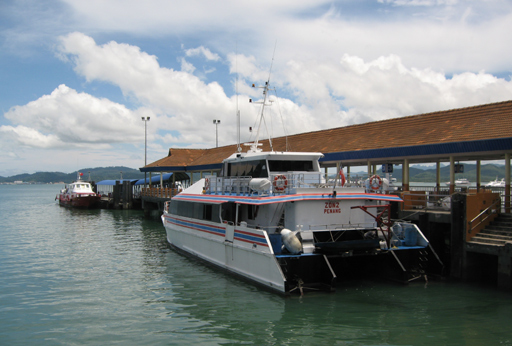 Since Callisto would wait for us at Telaga Harbour Marina the first leg of the trip would be a ferry ride from Langkawi to Penang. After renting a car in Penang we were off to the open road. When you don't read the local language road signs with pictures are a great help. 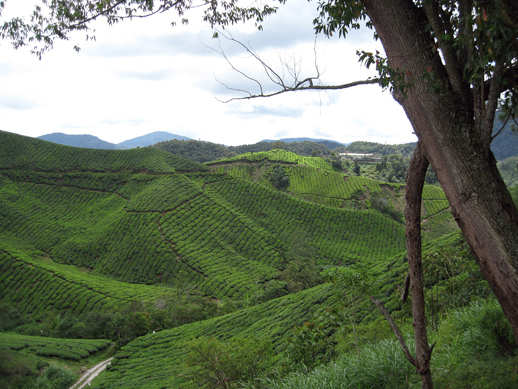 The first stop was the Cameron Highlands. At altitudes of between 4000 ft. and 6000 ft. and temperature ranges between 50°F and 70°F the highlands are a great place to escape the sweltering heat of the coast. 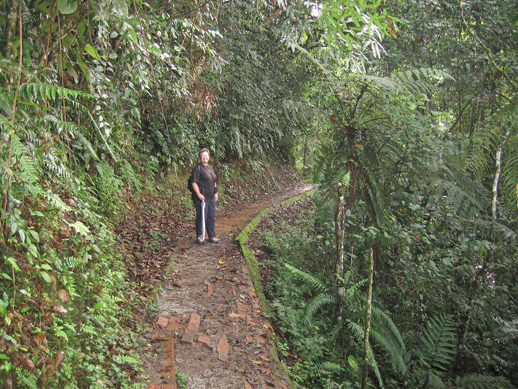 There are extensive hiking trails from which to enjoy the jungle flora and fauna. Some, like this one, are well maintained and easy on us aging hikers. Some of the trails, such as this one, offered a bit more challenge and then there were those only for the hearty, which we did not even attempt. 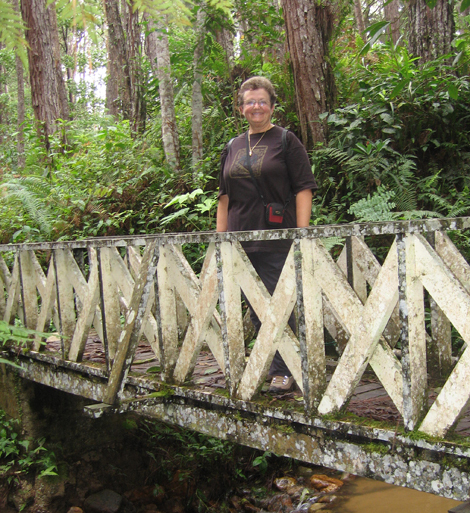 Jane on a lichen covered bridge on a Highland hiking trail. The Highlands get a lot of rain and have a very rich and productive soil. They grow a lot of fruits and vegetables and have large tea plantations. 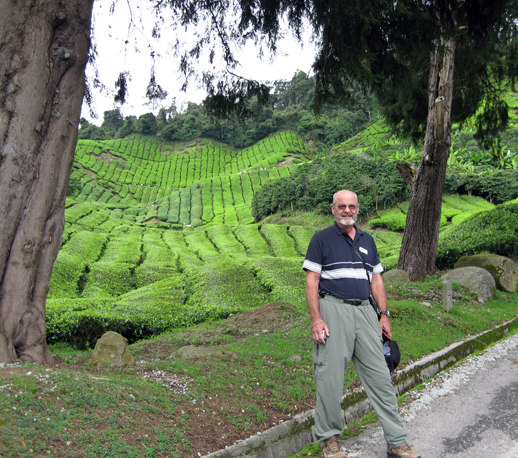 The tea plants seen behind Walt, are laid out in closely spaced hedge-like rows. The harvesting is done by machines similar to a hedge trimmer, unlike the Ceylon teas of Sri Lanka, which are still picked by hand. The Boh tea plantation has tours of their facility where the tea making process is explained with a shop at the end to sample the various brews. We are on the patio of the shop over looking the plantation. 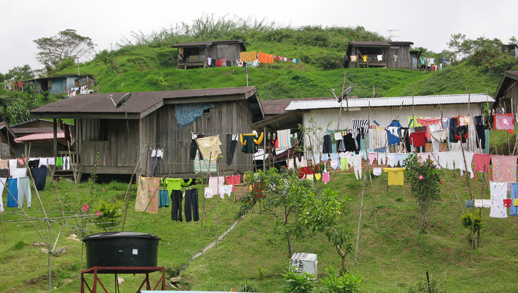 The Pahang State government is taking a forced modernization approach. 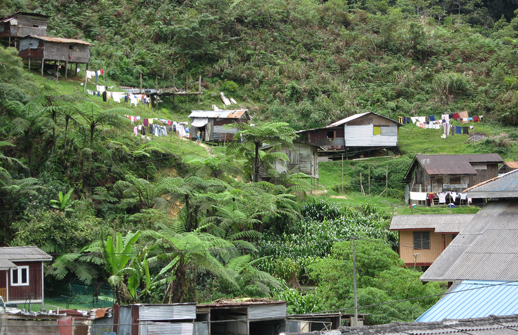 The Orang Asli are given this village in which to live and a state stipend. 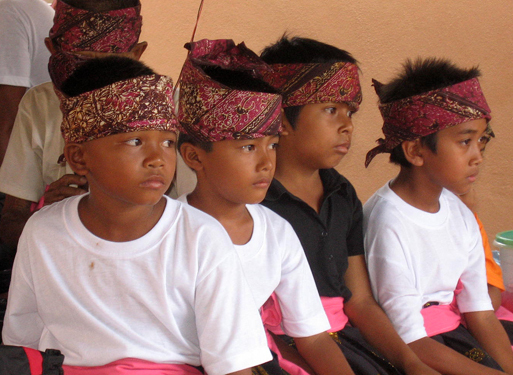 When children reach school age they are required to live in a dormitory and attend school. If the kids are left at home they don't go to school. 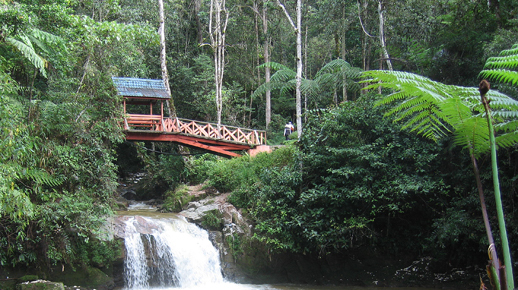 Taman Negara is a area of rain forest set aside as a national park. 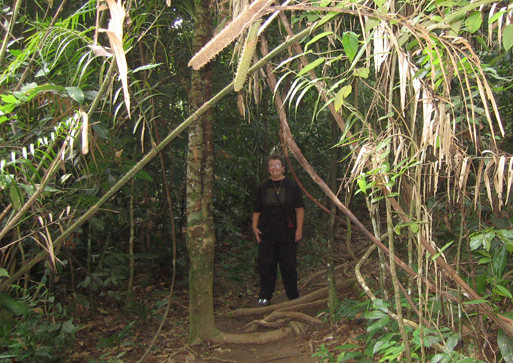 It covers over 1675 square miles and is one of the oldest primal rain forests in the world. For the most part, it is being kept in its natural state. Some improvements have been made around the periphery for the enjoyment of those of us not up to jungle trekking. 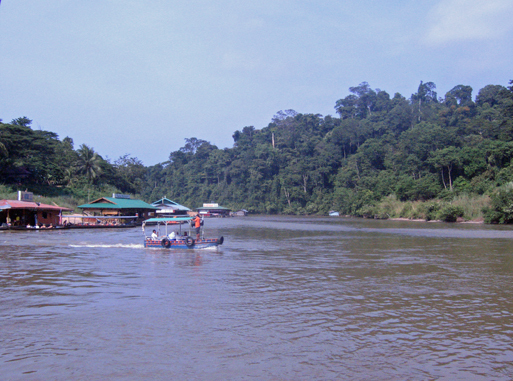 We stayed in the village of Kuala Tahan, across the river from the park and took these ferry boats into the park entrance. There are no roads in the park, but the area around the park headquarters has several hiking trails suitable for day trippers like ourselves. 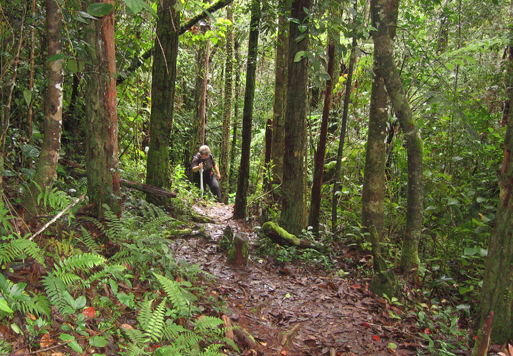 Guided treks of several weeks into the deep jungle can be arranged for the more hearty. 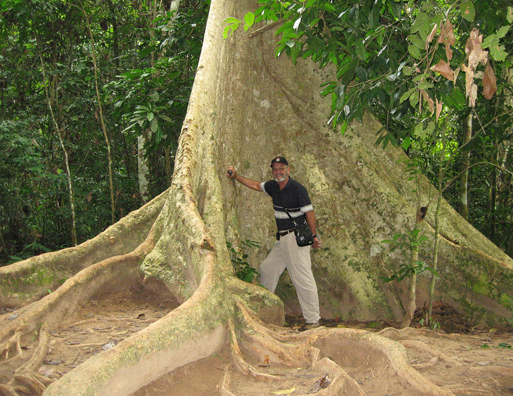 The giants of the rain forest are the tualang tree. Supported by huge buttresses, these trees can tower up to 250 feet above the forest floor. The branches, which start 100 feet above the ground, are a favorite nesting site for the rock honey bee. The nest from just one tree can yield 1000 lbs of honey. The array of plant life in the forest is overwhelming, we took a native guide to explain some of the plants and their usages, but it would take a life time learn it all. 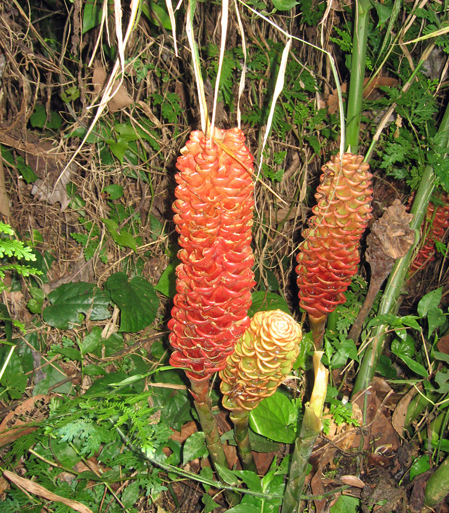 This is a wild ginger. 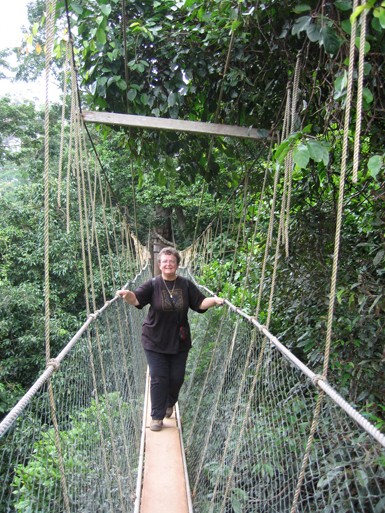 The Canopy Walkway is a series of rope and plank bridges 1500 feet long that is suspended in the trees up to 130 feet above the forest floor. On the ground the forest is so thick you can only see a few yards in any direction. The walkway offers a birds eye view of the forest. A couple of rare birds in the tree tops. 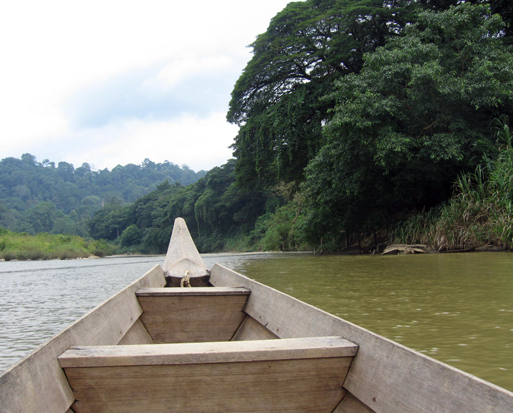 A boat ride on the Jungle shrouded Tembeling River would take us to a village of the aboriginal Batek people. 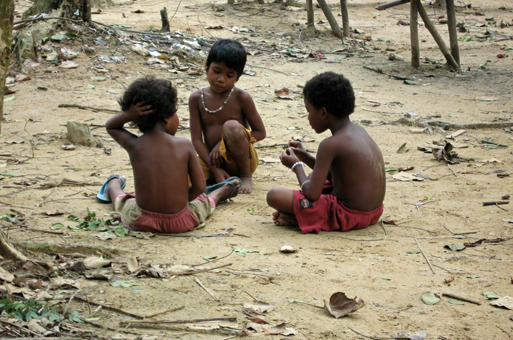 These Orang Asli, unlike those of the Cameron Highlands, are allowed to live at will in the Taman Negara. 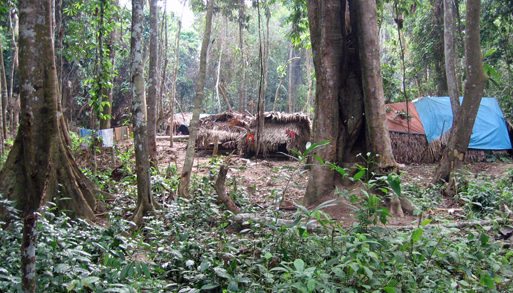 They are still very much hunters and gatherers living mostly from the bounty of the forest. Employment in the surrounding communities, modern medicine and schooling for the children are used as enticements to join the modern society, but most choose not to partake. We were told that an attempt was made to force the children to attend school, but they would just fade away into the jungle until the authorities would give up. 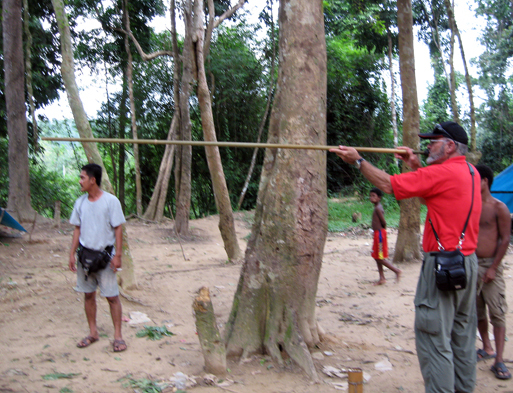 Most of the men of the village were in the jungle hunting when we visited. 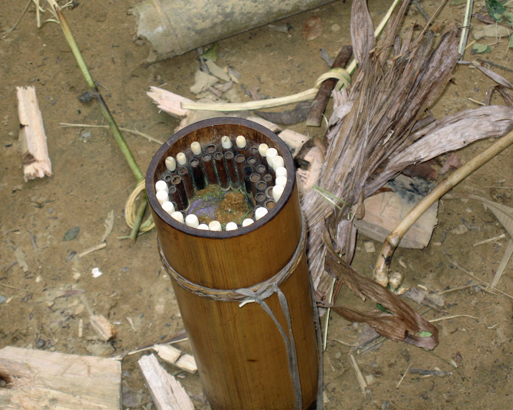 Some, however, were detailed to stay and earn money for the village by showing tourists how they make fire and poison darts from the materials available to them from the jungle. This quiver and its poison darts are all products of the forest. The fletch for these darts is made from a wood lighter that balsa and sanded smooth with a special abrasive leaf, it was all quite amazing. They also showed the tourist how to shoot a blow gun. The blow gun is an amazing piece of work itself. Made of bamboo, over 6 feet in length and as strait as any rifle barrel. Walt was the only one to hit the target. What a show-off. 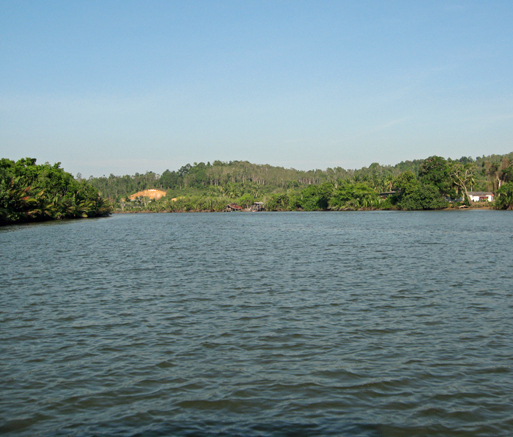 The city of Terengganu is the capital of the Malay State of the same name. 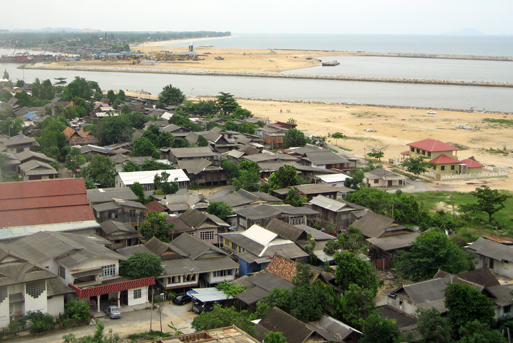 It sits on the South China Sea and has been transformed by oil production from a stilt house fishing village into a modern city. 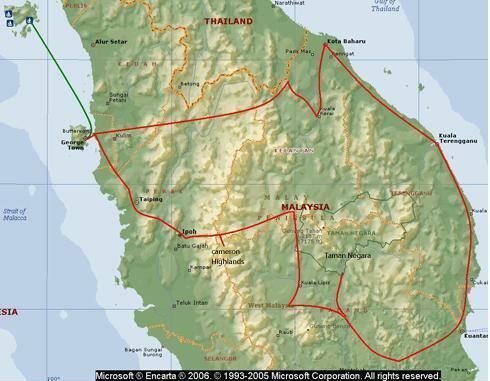 It has a long history as an Islamic Sultanate and is today one of the most Islamic of the Malay states. 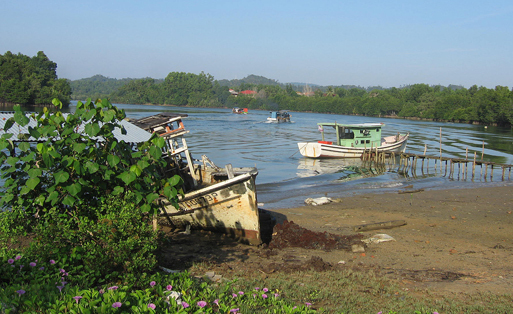 The Marang River reaches the South China Sea at Terengganu. Since we were in the city over the Muslim week-end and most things were closed, we took a trip on the Marang to a rural Malay village. In a very short time the banks of the Marang become peacefully rural with monkeys playing in the mangroves and sea eagles soaring overhead. 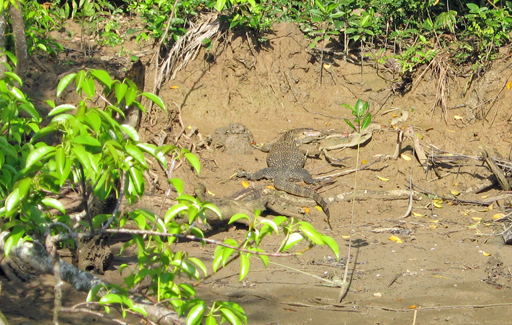 This is one of many large monitor lizards seen on the river banks. This gentleman trains monkeys to climb coconut trees and harvest coconuts, a trade that is fast loosing its relevance. He and his wife served us tea while the monkey fetched us a coconut. Kota Bharu is the capital of Kelantan state and the last major city on the Malaysian east coast before reaching Thailand. 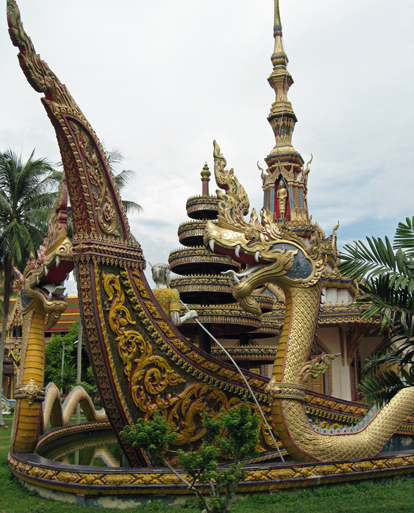 This Thai temple is evidence of the large cross-boarder culture exchange that exist even though Kelantan is another of the more conservative Muslim states. 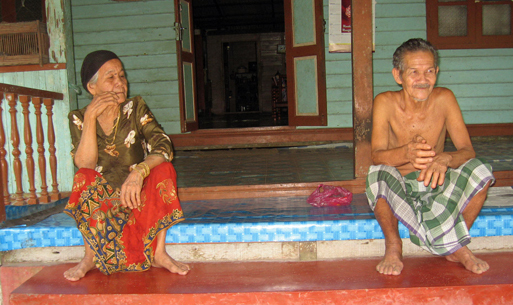 Kota Bharu is noted for being rich in traditional Malay culture. 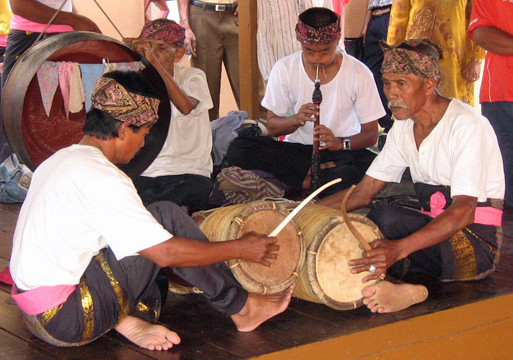 This group playing classical instruments accompanied a ritual combat dance. 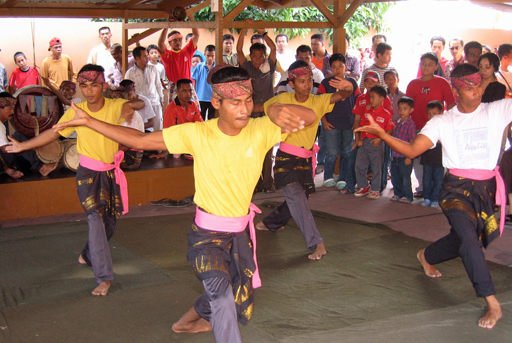 These men are performing a ritual dance that ends in a wrestling match that itself ends when one or the other is flat on his back. 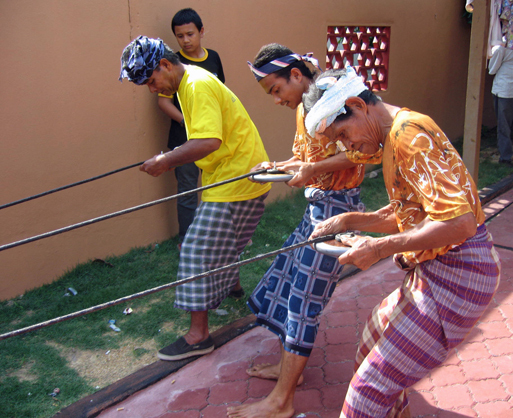 Top spinning can be found in most cultures, but the Malay have elevated it to a sport using large heavy tops finely made from wood and pewter. These men are tightly winding their wax coated throwing lanyards onto the tops. 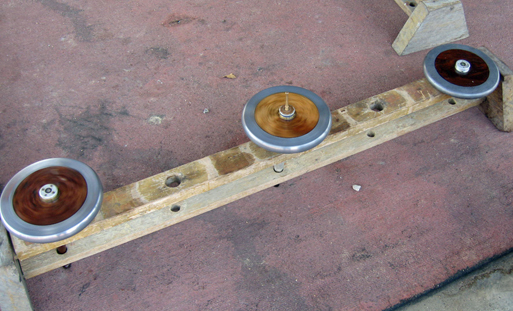 The tops are thrown onto a small stage where they are scooped up by the man with the wooden paddle and placed on a peg. The pegs with spinning tops are placed on a rack where they will spin for more than an hour. Walt trying his hand at beating a rebanna ubi. 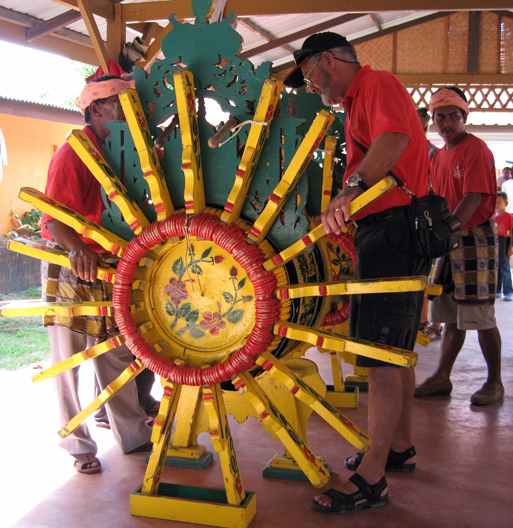 These large drums weighing several hundred pounds are made from the wood of the jack fruit tree and are played in groups of 8 to 10 keeping interlacing rhythms. 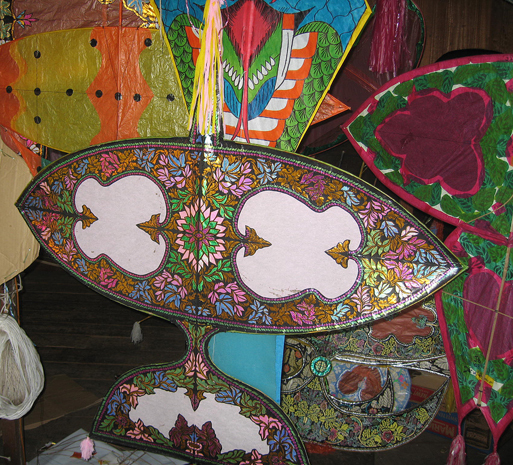 Kite flying is another Malay sport and kite making is a fine art. The craftsman in this shop grows, dries and splits the bamboo from which the frames are made into elaborate shapes. He then hand draws and hand paints the beautiful designs. Each kite represents hundreds of man hours of work. 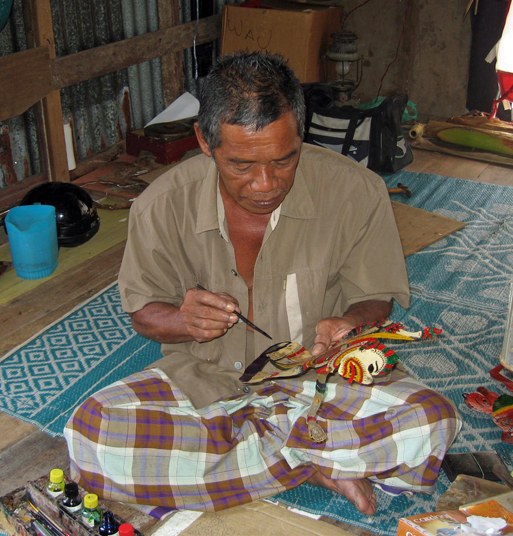 The Malay kite is such a cultural icon that a local jeweler uses the motif to fashion jewelry. 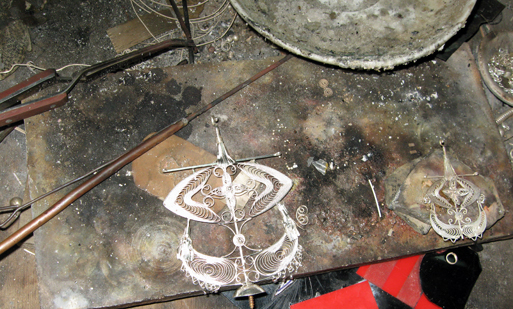 This is a silver pendant. 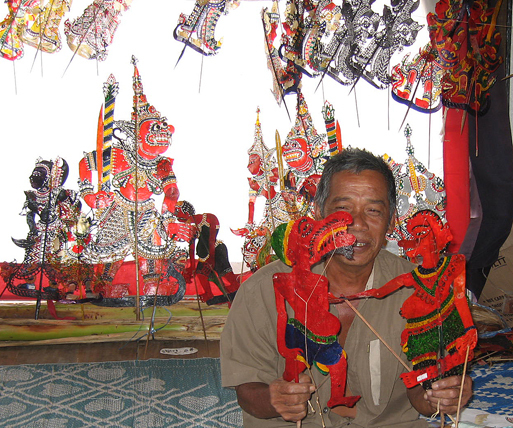 The Wayang Kulit is a form of puppet theater performed in Malaysia. The puppeteer makes the puppets from buffalo or cow hide and hand paints them. The play is performed with the puppeteer behind a back lighted semi-transparent sheet. One man manipulates the puppets and does the voices for all the characters in the play. 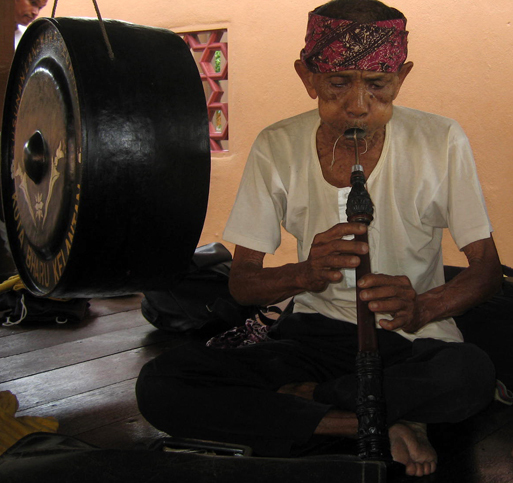 Another dying art form, it was outlawed for a time by the current government of Kelantan for being un-Islamic. 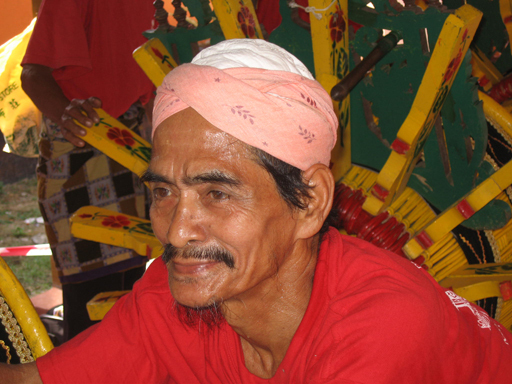 This man still manages a theater and is sponsored by the government at cultural fairs throughout the S.E. Asian region. 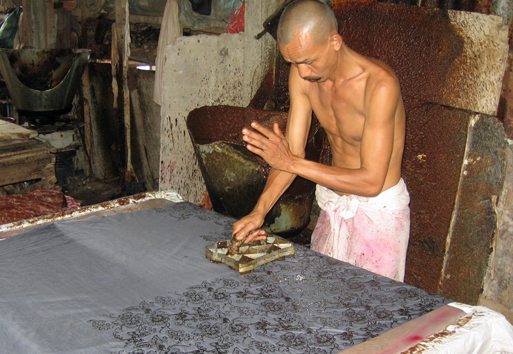 Batik fabric is still hand stamped in this small family run factory. 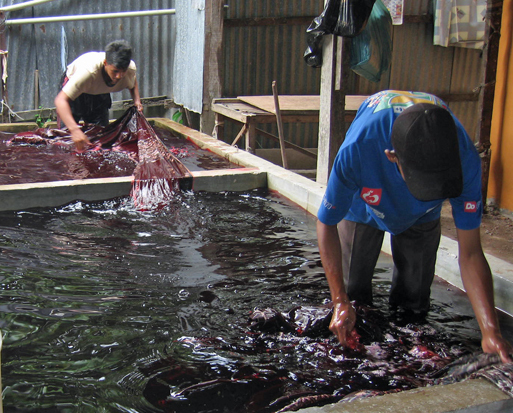 After being stamped with dye resisting wax the fabric is dyed. Each color requires a new round of waxing then dying. 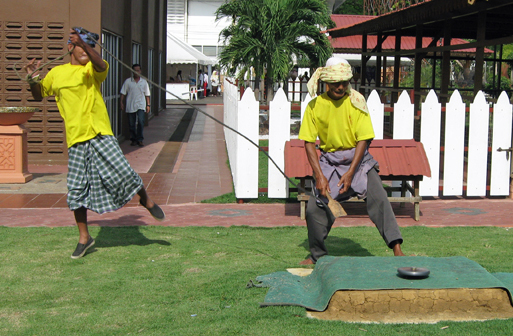 The faces of Malaysia, on the left young men waiting their turn to perform, on the right top spinners. 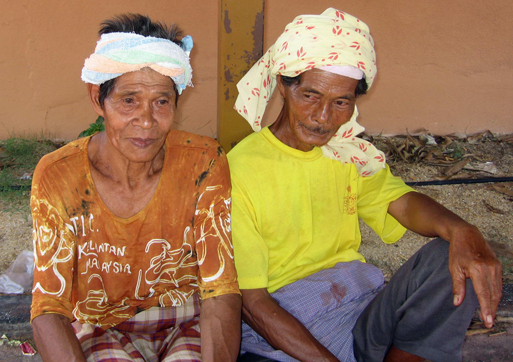 The faces of Malaysia, on the left drummer, on the right flautist. We now head home to Callisto in Langkawi.